Where trees in urban areas are concerned, many questions can arise, be they of a tree-specific, legal or ecological nature. Trees are living organisms, and we should find the best way to keep them in good condition for as long as possible. Public safety has to be guaranteed, but the intrinsic value of the tree has to be preserved as well. Also, when a person is injured by a tree, the experts need to be called in. As we are publicly appointed and certified experts, we will inspect your trees with non-invasive methods and write an assessment based on current scientific knowledge, specialist literature and case law. Tree owners are personally liable for the stability of their trees and for ensuring there is no risk of fracture. The owners can be prosecuted according to both civil and criminal law for damage caused by their trees. It is therefore essential to have the trees inspected continually and professionally. 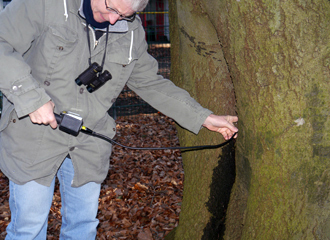 Brudi & Partners assists tree owners in fulfilling their tree-monitoring obligations. This normally involves just a visual inspection from the ground, to identify anything that looks suspicious. 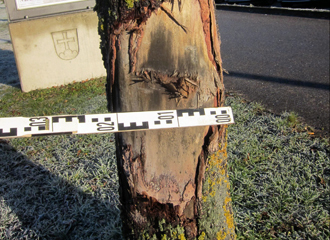 If any signs of defects are detected during this type of inspection, expert knowledge is needed to assess the effects of the visible symptoms on the health and safety of the tree. Only then can remedial measures be taken. In exceptional cases, we recommend the use of advanced technical examinations to gain a clear picture of the tree’s condition and its safety reserves. When pronounced damage is evident, in-depth examinations with technical devices can provide the facts that will determine the next course of action. Also, when disputes arise, the use of diagnostic methods and procedures can supplement the visual inspection with facts and correlations, thus providing evidence and maintaining an objective level of discussion. 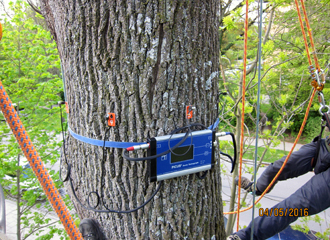 Brudi & Partners not only have a wealth of experience in the evaluation of tree-static measurements, they also have all the state-of-the-art equipment necessary for carrying out technical tree diagnoses. 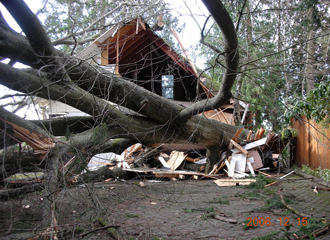 Serious damage caused to property or people, for example by a tree collapsing, can often lead to legal disputes or criminal proceedings. The main question will always be whether the damage could have been foreseen. Brudi & Partners have vast experience as expert witnesses in numerous court cases and pre-litigation disputes, and can therefore provide qualified consulting services in the event of lawsuits. As qualified assessors with a well-established service record we can often contribute to the acceleration, or even the avoidance, of court proceedings. 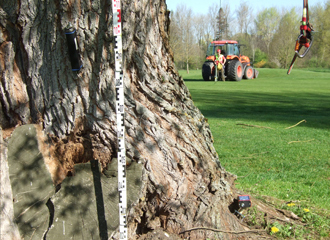 If doubts exist about the correct procedure to follow after a tree inspection has been carried out, Brudi & Partners can, while in situ, provide an immediate, verbal, expert opinion, give an estimate of the hazard potential of defect symptoms, and/or recommend effective arboricultural measures. These binding statements about the degree of risk posed by the tree serve as expert backup for the owner or tree inspector, especially when they have to decide whether to preserve or fell the tree. Brudi & Partners draw up assessment reports with calculations of the monetary value of trees, and of the total value of damage caused to greenery, for use by courts, authorities, insurance companies, and private clients. valuations for property sales and partial assignments of property, or the premature end of leasing contracts and expropriations. § 249 is only applied in cases where a direct replacement is possible, e.g. with young trees in nurseries, which are also regularly planted in new areas. This must not, however, put the aggrieved party in a better position than before the damage occurred. Temporary damage to trees can also be directly compensated for. The assessor compiles all of the costs of immediate measures as well as the costs of increased maintenance until the tree has fully recovered, and also takes into consideration the risk that the tree may still perish despite receiving horticultural care. § 251 is applied in cases where the damaged tree is so large and old that it cannot be replaced, unless at a disproportionately high cost, by anything available from a tree nursery. In cases of expropriation, restoration is simply not possible. The KOCH method can calculate, by means of the asset value method , the usual cost of producing such a tree and by depreciating it according to age as well as accounting for any previous damage. If a large tree is considered a write-off, then immediate restoration can only be carried out by the planting of a reasonably sized replacement tree, as the expense would otherwise be out of proportion. This still leaves a difference in value compared with the situation before damage occurred, because the new tree cannot perform the same function for years to come. Again, the KOCH method, which is recognized by the high courts, can be applied to gain an indication of the remaining loss to the value of the property. Today, aspects of nature preservation play an increasing role when anyone plans to build on a piece of land. Environmental awareness has grown, and current nature protection laws demand careful treatment of existing vegetation. Land used to be completely cleared of vegetation to make it ready for building on, but this is seldom tolerated now. Often, trees that have been categorized as retention-worthy happen to be located on the perimeter of or even within work areas where machines are situated and are therefore at risk while construction takes place. 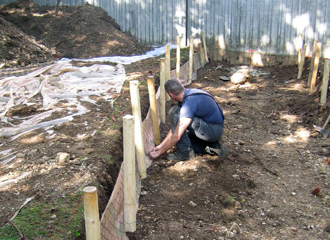 Professional ecological preparation of a construction site plus supervision during the building phase helps prevent damage to trees, and especially to the area where their roots are situated. with the final inspection and acceptance of tree maintenance work and construction services in connection with tree retention. Retain tree stock - yes or no? 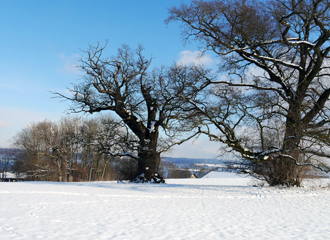 If construction plans make it impossible to retain the entire tree stock on the site, the following questions usually arise: which trees are worth keeping for the medium term, which trees are worth the sometimes costly measures of retention and protection, and can the planned building be adapted in any way to accommodate the trees? Brudi & Partners can assist in the planning process by offering neutral and sound, expert assessments of the retention-worthiness of trees on the basis of comprehensible criteria. In certain cases it makes sense to evaluate the existing tree stock before purchasing a property, so that construction plans can be made which are practicable. Tree protection begins in the planning phase and continues in the tender procedure via the incorporation of special and additional terms and conditions in the contract. It is implemented by the close monitoring of the project during the construction phase and ends with the final inspection and acceptance. Successfully implemented projects show that effective tree protection and the consideration of other ecological issues are all possible when experienced, unbiased specialists are engaged. We seek to talk with all of the parties involved, explain professional procedures, and offer practicable technical strategies in the event of a conflict of interests on the building site. “Any tree which is to serve as a platform for any type of element must undergo inspection by an arboricultural expert witness to determine the tree’s physiological and mechanical condition.” (EN 15 567-1). Brudi & Partners can provide sound, expert evaluations in the planning stages, carry out the required annual tree inspections, and certify the load-bearing capacities of the trees. 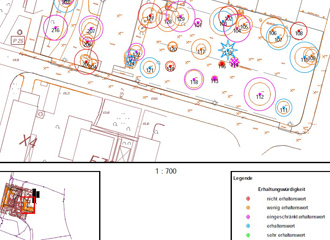 Brudi & Partners have provided numerous assessment reports covering installations in trees and are therefore fully conversant with the requirements and potential solutions in this sector. In cooperation with the European Ropes Courses Association European Ropes Courses Association (erca e.V.) we are also playing an active role in professional advancements in this field. Locations for ropes courses and adventure parks are not easy to find. The most important aspect is ensuring that they are easily reachable and located in the catchment area of people who would use them. The long-term success of these places, however, depends on the suitability of the tree population. 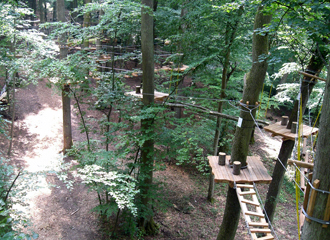 The type of soil and vegetation, variety of tree species and size classes, as well as previous damage and the extent of pests or disease present are all factors which dictate whether a ropes course project will be feasible and sustainably economical without causing any long-term damage to the environment. The load exerted by the installation has to be matched by a tree of a certain diameter. Heights and locations of trees are important when considering the risk of wind throw. Expert knowledge of trees can provide the crucial basis for decision-making when planning a ropes course; it can also help to keep discussions objective and to ensure acceptance during the authorization process. 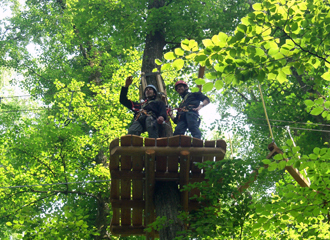 Naturally, there are high safety requirements for rope courses and adventure parks. Regular inspections by qualified experts are therefore essential. Any changes which could adversely affect the trees supporting the platforms, fresh indications of trunk defects, and any risks located in the crown must be recorded reliably and remedied. Brudi & Partners contribute to the safety of rope courses by carrying out thorough inspections and by giving advice on safety measures. The forces to which trees in rope courses are subjected are much less than those caused by the wind. Nevertheless, the load-bearing capacity of the trees supporting the installation has to be documented by an expert tree assessor. 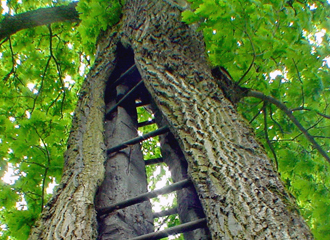 Wherever doubts exist, there are ways of evaluating a tree’s load-bearing structure according to engineering principles. 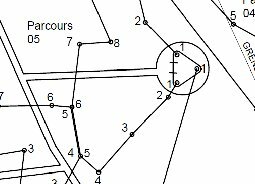 The tree’s species and, above all, the trunk diameter and the heights of the anchor points are the decisive factors here. From their many years of experience and the research they have conducted, Brudi & Partners can estimate how trees will behave in a fall arrest scenario on the basis of reasonable load assessments. This makes it possible to safeguard installations without the need for any exaggerated measures. One very special field of work for anyone involved in arboriculture concerns very old trees, and ancient trees that originated long before we did. These trees often provide habitats for many now rare species. Young trees can also provide an important habitat for other organisms; however, habitat and veteran trees are to be given priority according to nature conservation regulations that distinguish between the preservation of “general” and “special” species. Legal requirements determine how they are to be maintained. Very old trees have different biomechanical and biological characteristics to young and medium-aged trees. Their trunks and branches are often hollowed out and only subsegments of them tend to still function. Frequently, they are the remnants of a bygone cultural landscape and can be several centuries old. For beetle fauna in particular, these trees are essential, since their longevity provides generation upon generation with an irreplaceable habitat. Certain of these highly specialized and therefore rare species of beetle have recently attracted public attention (e.g. the hermit beetle). In the spirit of nature conservation laws, we endeavor to preserve irreplaceable ancient and other valuable old trees. We draft long-term management plans that take not only the tree but also its surroundings into account. This may involve tree maintenance measures, such as retrenchment pruning, to support the tree’s aging process and prevent it from dying off prematurely, for example due to static failure. The role of a tree as a habitat also has increasing significance for the authorization of smaller construction projects and land-use plans. Often this affects individual trees in urban areas, which are the hosts of particularly or highly protected species as denoted in §44 of the German Federal Law on Nature Conservation. Inspections conducted early on, e.g. a year before the planned clearing of the land, can identify relevant habitats. Continuous ecological functionality measures (CEF) can be carried out in advance, or it may be possible to avoid interfering with the tree’s residents altogether. Our expert arborists can climb into even the hard-to-reach parts of a tree to determine where habitats exist and to inspect them. We provide the corresponding legal assessment report or statement, with recommendations for avoidance or replacement measures. Complex issues can be clarified by the species experts in the network of professionals that Brudi & Partners collaborate with. Brudi & Partners use only tree-friendly diagnostic procedures for their advanced tree inspections, to cause as little injury to the tree as possible. Invasive examination procedures for inspections regarding public safety have not been used for years. Deciding which procedure to follow in each individual case depends on the particular issue at hand. the tilt of the root base. These values can be electronically stored and monitored on a computer. 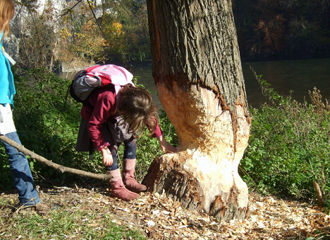 This ensures that the tree is not “overloaded” and that its load-bearing structure, bark and roots remain undamaged. Each pulling test is stopped once a relatively small reaction has occurred. 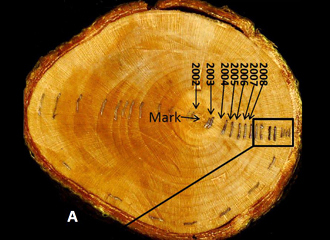 Sonic tomography conducted on a tree trunk cross-section can give clues as to the extent of hollowness at certain levels. The speed with which sound waves travel through wood depends on the wood’s anatomy, density and modulus of elasticity. Decayed wood is less dense and therefore affects the distribution of sound waves. Even the beginnings of decay can alter the wood’s properties, affecting the distribution of sonic velocities. 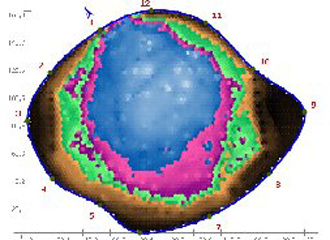 A sonic tomogram enables the trunk’s inner condition at various levels to be displayed and analyzed according to color images ranging from brown (stable wood) to blue (cavity). Brudi & Partners always combine the evaluation of ultrasound tomograms with an individual estimation of wind load. Reliable evaluations of risk can only be made when wind load is considered as part of the risk potential. 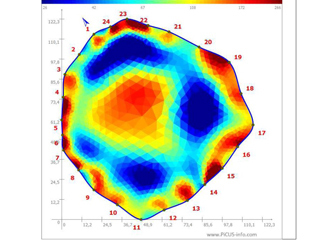 Electric impedance tomography can be used to supplement the sonic examination with further important information about the internal condition of a tree trunk. An electric current is fed into the trunk through its outer growth ring, and spreads quickly or slowly depending on the wood’s moisture content and density. A very high moisture content puts up little resistance and points to the beginnings of or the existence already of decay. Color codes are also used in this method to show the internal condition of the tree, ranging from blue (high moisture and high conductivity) to red (high electric impedance due to low moisture, decaying wood, or cavities). Brudi & Partners always combine sonic tomograms and electric impedance tomography with an individual estimation of wind load. Reliable evaluations of risk can only be made when wind load is included in the safety statement. In our moderate climate, trees produce new wood every year. In spring, the new wood has large pores and is light in colour, whereas in summer it has smaller pores and appears darker. Both growths together form an annual ring. This enables examinations of past occurrences with reference to time. determination of the time of damage.